The long awaited update to the US EPA’s municipal stormwater permit (MS4) is scheduled to be released before the middle of April. The long awaited update to the US Environmental Protection Agency’s (EPA’s) municipal stormwater permit (MS4), which regulates the discharge of polluted runoff from roads and parking lots into rivers and streams by municipalities, is scheduled to be released before the middle of April. In meetings held two weeks ago between EPA, the Mass Department of Environmental Protection (MassDEP), conservation groups and municipalities, EPA indicated that the permit had been finalized and was just waiting while the MassDEP decided whether or not to co issue it. On March 31, MassDEP sent a letter to EPA indicating their intention to co-issue in spite of their reservation. 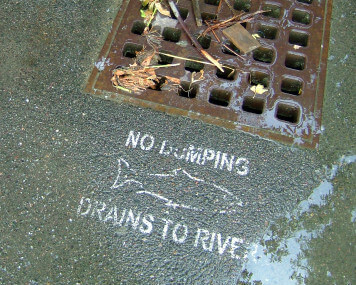 The Draft of the EPA permit had been cheered by environmental groups who saw it as an important, albeit imperfect, first step toward cleaning pollutants discharged by municipal storm drain systems which have become the number one reason why waterways across the Neponset River Watershed and Massachusetts violate fishable-swimmable water quality standards. Some municipalities expressed concerns about the cost of implementing the permit requirements, and MassDEP under the Baker Administration had been strenuously advocating with EPA to reduce both the administrative requirements of the permit, as well as some of its substantive environmental protections, and to allow for more years before pollution discharges must be reduced. At the meeting, EPA provided some clues as to what the final provisions in the permit will look like, including changes such as more time for communities to locate and eliminate sewer leaks and other illicit discharges from their storm drains, and increasing the amount of pollution that will be allowed in runoff from private redevelopment projects. Another important announcement is that the effective date of the permit will be postponed for one full year, to the spring of 2017 which will help synchronize the permit with municipal budget cycles. The Neponset River Watershed Association (NepRWA) has been working for several years through the Neponset Stormwater Partnership, to help our local communities prepare for the new permit by updating local bylaws, helping them prepare for detecting sewer leaks, and develop required outreach and education materials. The goal of the Neponset Stormwater Partnership is to help communities save money and accomplish more pollution reduction by working together on a regional basis to share best practices and take advantage of economies of scale. While NepRWA was disappointed to see that several key provisions of the permit apparently have been weakened, we are very pleased to see that the final permit is at last being released. By the time the revised permit takes effect next year it will be a decade overdue, and we have been very anxious to see our communities move from the planning phase into implementation. In working with our communities through the Neponset Stormwater Partnership, we have found that our cities and towns recognize the impact that their stormwater has on water quality and are sincerely interested in cleaning up their discharges so that local residents can enjoy the benefits of clean water and healthy waterways. With that in mind, we are looking forward to getting started on implementation with our communities, and we expect to see noticeable results in the near future with less time and expense than most have been expecting during the debate over the draft permit requirements.